The "Theory of One" is a first cause theorem based on mathematical probablity and the laws of logic. The author takes this approch to prove the likelyhood of a first cause and what this cause might have looked like in a pre-universe. He also takes a mathematical approach successfully eliminating chance as a first cause. The book goes on to show how there must be one cause in the universe that is transcendent above everything else, and that is necessary and eternal in nature. For anything to replicate itself, there has to be "one" otherwise muliplication of zero would produce nothing. Daniel Velazquez develops a theory which allows the reader to essentially eliminate anything unnecessary and predict what would happen first given any two default conditions. Share us on Facebook with button below ! 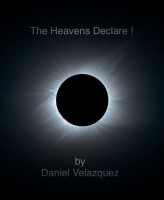 The Heavens declare is a book about the heavenly signs in the skies. God tells us in his word that the heavens declare his glory. A declaration is something that tells about an event or person. The only way to prove for certain if there is a God is to look at his creation, specifically what these signs in the heavens say. If we can show for certain a correlation between the Biblical events and events in the sky, we must come to the conclusion that the universe is ordered and created. The book "The Heavens Declare" shows this correlation in the heavens and God's holy book the Bible. Readers will be stunned to see these signs right in front of their eyes using Star gazing software that rewinds to specific events in history. You will come to a startling realization that we are not alone in the universe, but that there is a grand design and designer! This ebook comes with a series of twelve videos which describe the major signs of the bible in real time using astronomical software. Remember to spread the word and hit Facebook share button below !